Trained by Venetia Williams in Herefordshire and ridden by Liam Treadwell on his Grand National debut, the nine-year-old won by 12-lengths. Comply or Die (14-1) held off My Will (8-1) for second, with Welsh-trained State of Play (14-1) in fourth. Mon Mome was the first 100-1 shot to win since Foinavon in the freak 1967 race, and there has been no longer-priced winner in the race's 162 runnings. Williams, a former Grand National jockey, became only the second woman after Jenny Pitman (Corbiere in 1983 and Royal Athlete in 1995) to train a National winner. In a keenly contested race, there were still around a dozen horses in with chances with two fences to go - and Treadwell's mount was among those nicely in contention. He kept Mon Mome out of trouble on the outside and a strong run between the last two fences left him at the head of the field alongside Comply or Die. But he crucially carried six pounds less than the 2008 winner, and in the end that weight difference proved vital. A delighted Williams, whose own riding career was ended prematurely by a broken neck in a fall at Worcester, said afterwards: "How can you ever expect that in a race like this? "I'm so proud of the horse. I'm so proud of Liam for giving him such a good ride, and the girl who looks after him as well. Treadwell added: "It's an absolutely unbelievable finish, I had the perfect run through the race, he jumped brilliant for me. "A couple of times loose horses fell upsides me and went under his legs but it didn't really affect the horse. "He gave me such a great ride. 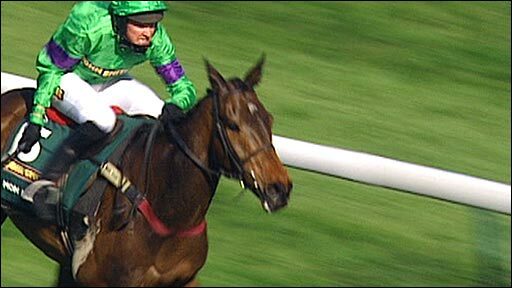 He was an absolute pleasure to ride. He is so genuine." Although he was a comfortable winner, Treadwell was unsure where his nearest challengers were at the finish: "I had a quick look round but I wasn't really sure how far in front I was." The 7-1 favourite Butler's Cabin finished back in seventh meaning Tony McCoy is still waiting for his first Grand National victory. 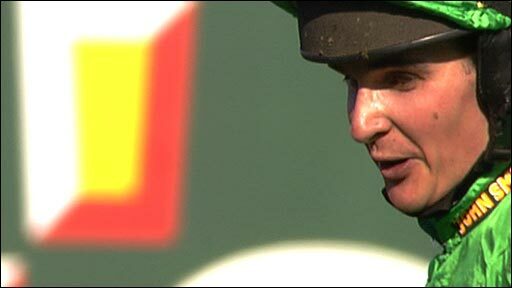 Jonjo O'Neill's charge needed medical treatment afterwards but recovered. However, Irish challenger Hear The Echo from the Mouse Morris yard collapsed on the run-in and later died. Bookmakers hailed the success for Mon Mome as their best-ever Grand National win. Ladbrokes spokesman David Williams said: "It was better than we could ever have dreamed of. Liam Treadwell was our saviour. A win for Walsh or McCoy would have seen a multi million pound turnaround. "The sun shone on Aintree and the sun shone on the bookies. If last year was one for the punters, 2009 was very much one for us."